Rock Creek Lake in Rock Creek Canyon is several miles off and above Highway 395, an ideal place to experience the east side of the Sierra. 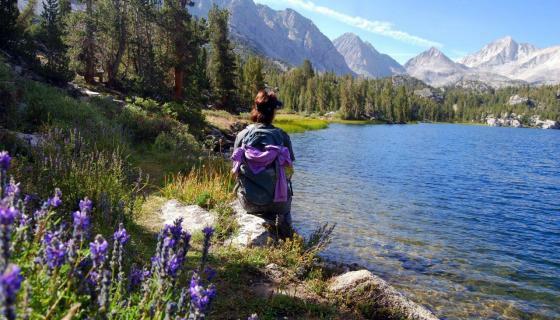 A lakeside campground, dramatic peaks, fishing, rock climbing, horseback riding and hiking in the John Muir Wilderness offer limitless recreation. The crystal blue lake and creek is a favorite of anglers of all ages. There may be a “Rock Creek” or two in just about every state in the country, but only one is home to the highest paved road in California. Located at the southern edge of Mono County, Rock Creek Road follows Rock Creek from Highway 395 by Tom’s Place up nearly 3,000’ and a dozen miles to the Mosquito Flats parking lot, some 10,320’ above the sea. About a mile before the road dead ends is where you can find Rock Creek Lake. 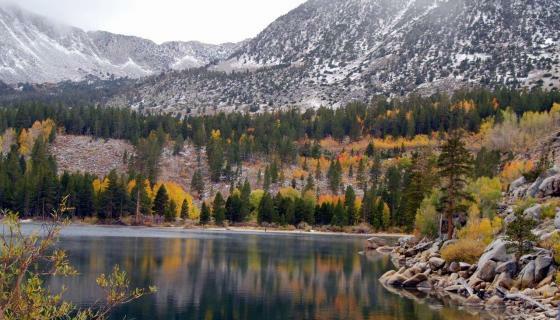 Rock Creek Lake is one of the highest drive-to lakes in the Sierra. 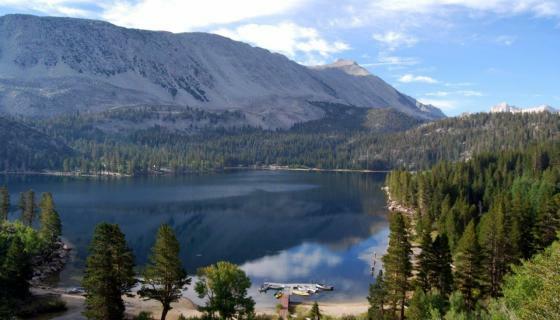 The 55-acre lake offers great fishing and views of the surrounding ridges of the High Sierra. It is also a great launch point for hikes to dozens of high country lakes and streams. The upper reaches of the Little Lakes Valley above Rock Creek Lake are even home to California’s state fish, the legendary golden trout. Rock Creek itself also offers some great fishing and hiking for those wishing to stay closer to the well-beaten path. Directions: From Highway 395, approximately 13 miles south of Mammoth Lakes, take Rock Creek Road nine miles west to the lake. There are a half-dozen campgrounds and lodges near Rock Creek Lake. The Rock Creek Lake Group Campground is located on the lake, is known for its breathtaking views of the lake and surrounding mountains and does not allow reservations. For more information, please call 760-873-2500. The East Fork California Campground is located down stream from the lake, on Rock Creek. It’s a little quieter than the lake’s campground. For more information, please call 760-935-4339. Cabin rentals are also available at Rock Creek Lakes Resort, Rock Creek Lodge and by Highway 395 at Tom’s Place Resort. On typical snow years, the waters at Rock Creek may open a bit later than other fisheries, but that seems to allow the fish more time to grow—and grow hungry. Rock Creek Lake, along with the creek itself and the numerous lakes that can be found in its canyon, offer some of the best brook and rainbow trout fishing in the region. Browns also call the Rock Creek region home, and though the fish aren’t always as big as you’ll find elsewhere, they are known for being a bit wilder and more feisty. The entire Rock Creek drainage is home to over 50 fishable lakes and streams, offering something for just about every angling ability, from the boat-accessed lake and its very fishable shoreline to hikes of just about any length. The variety and views at Rock Creek are tough to top.